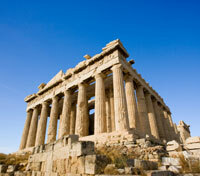 Wander the landmarks of historic Athens, including the temples of the Acropolis. Experience the wine-and-beach mecca of Mykonos with a private guide. Dine on Greek barbecue on a sunset cruise off the coast of Santorini. Laze about on the pristine white-sand beaches of the gorgeous Greek Islands. 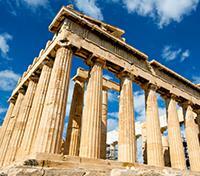 For a time, Greece was the center of the world – a thriving hub of politics, philosophy, science, and art. Sheltered by mountains and blessed with a coastline open to a glittering sea speckled with hundreds of islands, the gods couldn’t have picked a prettier location for their kingdom on Earth. The archaeological sites of ancient Athens reveal a rich culture whose achievements still stagger the mind more than 2,000 years after its fall, while the whitewashed hillside towns, azure waters, and snow-white beaches of islands like Mykonos and Santorini dazzle the eye with their beauty. 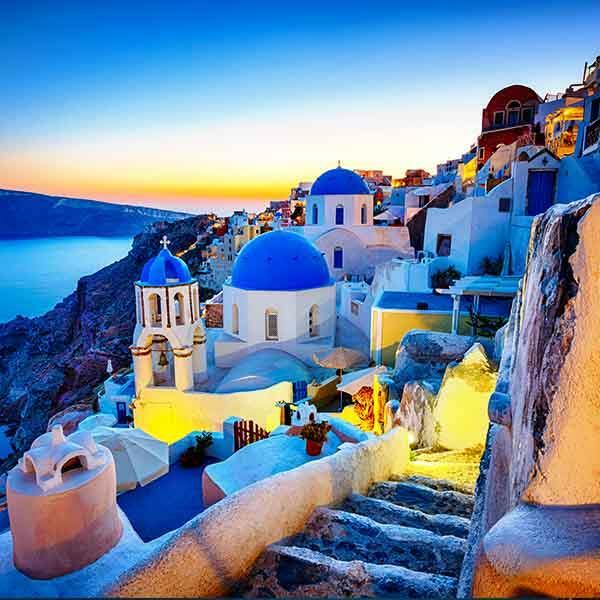 With so much to see and do wrapped up in such an attractive package, the only downside to visiting Greece comes with the realization that, ultimately, you’ll have to leave. Please note: This tour is only available from April to October. Electra Athens Hotel is an inviting and welcoming property, presenting a perfect blend of excellent Greek tradition along with modern and comfortable facilities. 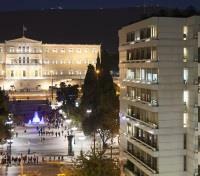 This property is located in the heart of Athens, on Syntagma Square, facing Greek Parliament. Situated at the start of the pedestrian street of Ermou, the hotel is within walking distance to the major historical sights, the old town of Plaka and the upscale Kolonaki shopping and dining district. The hotel boasts elegantly furnished guestrooms and suites that are extremely comfortable and come with a host of in-room amenities. Start the day by enjoying the delightful, award-winning buffet breakfast and continue with a unique gastronomical journey through the flavors of Mediterranean cuisine, by choosing from a la carte menu for lunch or dinner. Meet your private driver and English-speaking guide for a half day tour of Athens, including the Acropolis and the New Acropolis Museum. Start with a visit to the city center to see the exterior architecture of the Constitution Square, the House of Parliament, the Memorial to the Unknown Soldier, and the National Library. Take a brief walk along Herod Atticus Street, where members of the Presidential Greek Guard known as the Evzones can be seen in their distinctive uniform in the vicinity of the Presidential Palace. Continue your drive to the Acropolis, passing by Hadrian’s Arch. Stop for a visit to the Temple of Olympian Zeus and the Panathenaic Stadium across the street, where the first Olympic Games of the modern era were held in 1896. Next, spend some time exploring the UNESCO World Heritage Site of the Acropolis, the ancient citadel located on a rocky outcrop overlooking the city. Explore the architectural masterpieces of the Golden Age of Athens: the Propylaea, the Temple of Athena Nike, the Erechtheion, and its most famous ancient monument, the iconic Parthenon. End your tour with a visit to the adjacent New Acropolis Museum, home to the archeological artifacts uncovered at the Acropolis and its surrounding slopes. At the end of the visit, return to your hotel by private vehicle. Board a high-speed ferry for a transfer from Athens to Mykonos. Approximate ferry duration is 2.5 hours. Meet your private driver for a port transfer. Petasos Beach Resort & Spa offers an unforgettable retreat on its own private peninsula overlooking the turquoise waters of the Aegean Sea between Platis Yialos and Psarou Beach. With excellent service and luxurious comforts, the aesthetically perfect beach resort offers an on-site spa and health center, fitness center and 2-tier swimming pool adorned with waterfalls. Guests, in the comfort of an elegant scene, will experience personalized services in surroundings overlooking the deep blue colors of the Aegean Sea. This afternoon, meet your private driver for a transfer to the starting point of your walking tour of Mykonos. With a private guide, stroll along the seafront, past the local fish and vegetable market. Keep your eyes peeled for the island’s cheerful avian mascot, Peter the Pelican. Visit the antique-filled Folklore Museum, situated in a charming 11th-century house on your way to Papaportiani Church. Dedicated to the Virgin Mary, the Church is a famous example of Cycladic architecture and is one of the most photographed spots in the Mediterranean. 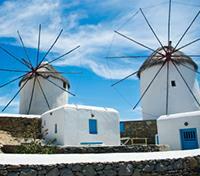 From here, continue onwards to the picturesque area of Alefkandra, known as the “Little Venice” of Mykonos. The gorgeous old houses are perched precariously on the edge of the sea, and the neighborhood is a popular area for local artists to set up their workshops. By the harbor, the iconic windmills stand guard facing the north, and offer a strikingly beautiful photographic opportunity. The windmills were used in the past to grind wheat, and provide a scenic vista overlooking Little Venice and the sea below. From here, continue to the House of Lena Museum, a great example of 19th century middle-class Mykonian life. End the afternoon with a stop at a local tavern for a sampling of Greek “meze”, including various traditional Greek dips and olives, feta cheese, and tomatoes. Enjoy a wine tasting with your guide, and learn about the history and terroir of Greek wines. Conclude your tour with a return transfer to your hotel. Board a high-speed ferry for a transfer from Mykonos to Santorini. Approximate travel time is typically 2 hours, though can range up to 2 hours 45 minutes. 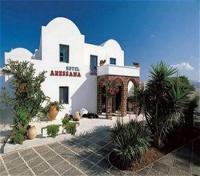 Aressana Spa Hotel in the town of Fira, provides guests with fairytale-like vacations from the moment they step through the 5 star design hotel’s entrance. Centrally located in Fira and only steps from the famous Caldera, this family-run hotel provides a peaceful base for its guests, with excellent spa facilities and a beautiful outdoor pool area. Emulating the serenity of Cyclades life coupled with the exciting buzz of Fira, Santorini, guests are welcomed like old friends with heartfelt sincerity. 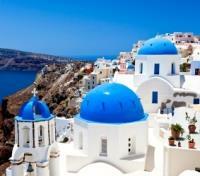 Santorini's many local taverns, shops and restaurants are just steps away from the hotel. 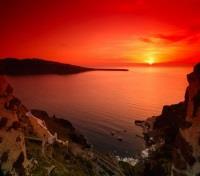 Santorini is a spectacular sight to behold, and a memorable experience at sunset. Experience the spectacular sunset this evening from the comfort of a small group shared cruise. Transfer by private vehicle to the Vlychada port and set sail around the island, starting with a visit to the famous Red Beach, a geologically unique area that was formed in a volcanic eruption. The beach is known as one the finest locations for swimming and snorkeling in Santorini, and the crystal-clear waters protect unique rock formations that are perfect for discovering. From here, continue sailing to the stunning White Beach, primarily accessible by boat or on foot from the Red Beach. Volcanic black sand contrasts the towering white cliffs above, and the sand is dotted with white pebbles and pumice stones. Enjoy a half hour at leisure for swimming and snorkeling in the clear azure waters of this cove. Back on board, savor a delicious barbeque meal on the ship’s deck, accompanied by crisp Santorinian wine. Continue sailing back to Ammoudi port, stopping below the village of Oia to watch the sunset over the Caldera, basking the sea with brilliant hues of royal purple, red and orange. Transfer back to your hotel from Ammoudi port by private vehicle. This evening’s tour includes round-trip transfers, BBQ dinner, drinks, snorkeling equipment and towels.